• Band is 301 Series Stainless Steel. • Housing is 201 Series Stainless Steel. • Screw is zinc plated 5/16” slotted hex head. • 1/2" Band • Band is 301 Series Stainless Steel. • Housing is 201 Series Stainless Steel. • Screw is zinc plated 5/16” slotted hex head. 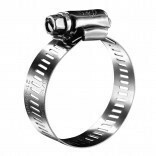 • All CTU Standard Hose Clamps exceed 60 inch-punds of torque • Recommended Installation Torque: 35-45in.lbs. (4.0 - 5.1Nm) • RoHS Compliant - No Hexavalent Chromium - Cr(VI) Material • All Hose Clamps are sold in boxes of 10.